Xiaomi has been stirring up quite a bit of commotion in the rumor mill lately. The Chinese manufacturer appears to have quite a few interesting devices in the works and info on release schedules and specs has been fluctuating massively, especially in regard to MWC 2018 and the new Qualcomm Snapdragon 845 chipset. 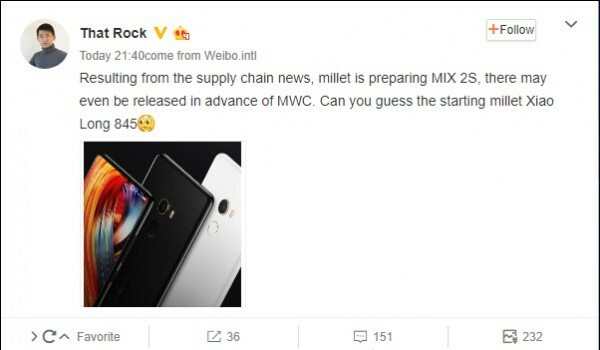 With the Mi 7 flagship now, allegedly, pushed back for after the Barcelona event, tension is mounting around the Mi Mix 2S. It was recently spotted, flexing some serious Snapdragon 845 muscle in AnTuTu scores. If that wasn't enough proof of its impressive internals and Snapdragon 845 ambassador status, an official-looking Xiaomi banner for the phone was recently unearthed. In explicitly lists a 5.99-inch panel, 8GB of RAM and 256GB of storage for the handset, as well as the aforementioned beastly Qualcomm chipset. But perhaps more impressive still is the included render of the phone and what is described as Full Screen design 3.0. It really does take the edge-to-edge display concept to a whole new level. 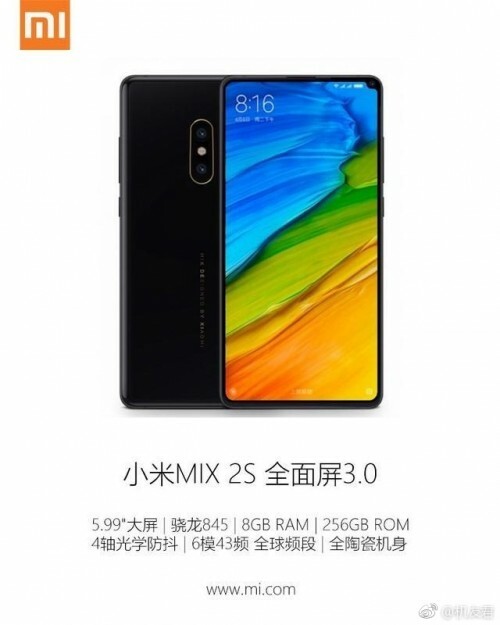 The Mi Mix 2s appears to have side bezels and top and bottom chins even slimmer than those on the Mix 2. Only the front-facing camera interrupting the all-display aesthetic of the handset and not by much, just taking up a small portion of the top right corner. We really do hope the render accurately represents the final product. Other, less substantiated rumors about the Mi Mix 2s, include a dual 12MP main camera setup, based on the Sony IMX363 sensor. Also, an under-display fingerprint reader as well as an on-device AI technology, to allegedly power iPhone-like facial recognition algorithms, among other things. miui has a theme to make it close to completely stock, coupled with all the customization available in it. FYI miui themes are system wide, oreo has started supporting it recently anyways..
Then don't buy a Xiaomi and stick with your HTC. They need customers more than Xiaomi anyway.